Jewelry Sale Craft Day: 10 a.m. – 2 p.m.
Tuesday, July 17, 2018, 10 a.m. – 2 p.m.
Last month’s craft day was a great success! We assembled more than 60 glittering book marks to sell at our annual Jewelry Sale this November. 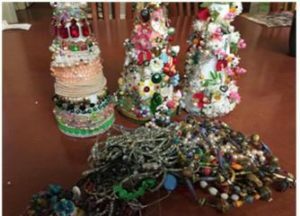 Next, we’ll celebrate Christmas in July by decorating small trees with bobbles, rhinestones, and beads. Come join the fun! RSVP to Hilary DePolo: hilary@artconsultation.com.